That's interesting. It'll be good to start the miner with "--list-gpu" to know if your GPU is detected. Please let us know If the miner sees the GPU, but refuses to start mining. Thank you, it's actually common, devs already working on it. How can i install on ubuntu vps? teminal (ssh)only not desktop or remote desktop? it tells me its not a valid debian package ??? Its definitely impressive. MinerGate xFast. I'm a veteran miner. 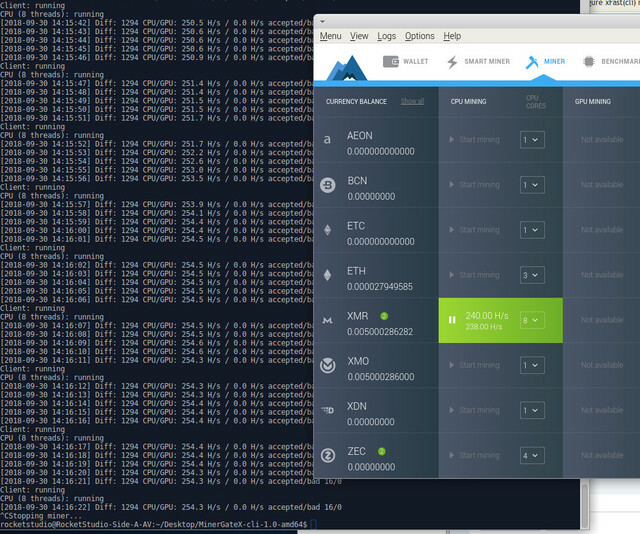 Been testing Minergate X. Theirs a guaranteed difference especially with CPU mining. and GPU mining. I've found alot of improvement. And its very compatible with alot of Hardware. I'm loving it. My Gpus were crashing at times. After switching to ,minerx. I'm liking it alot. Gonna let it run. And if I find any bad I will advise. But this far. Great. Thanks MG. I'm testing some mining software on this smaller CPU to see more noticeable differences. So, I have statistics from ZEC mining but I will post XMR. I'm building some miner boxes with smaller CPUs and I wanted to see the best interface for something I just turn on and leave to run. Also I'm trying to find the best OS for the boxes. I will post statistics From XMR as it seems most people are doing this. I don't have the GPUs set up yet, any advice on the best inexpensive 8GB GPU is most welcome. It appears to be much faster on a smaller machine, and so these improvements very likely make a big difference on more capable systems. dendev83 wrote: How can i install on ubuntu vps? teminal (ssh)only not desktop or remote desktop? it tells me its not a valid debian package ??? 3. Go to the folder where you've put the "minergate-cli" file and run it. More details in the screenshot below. Tested on Win10 using Ryzen 2700x and 1080s. On XMR. gets into the 650s for the cpu so it's right in line with Xmrig (bit slower if you look at max on xmrig) as to the 2 1080s.. they are perfectly in line with what you'd expect out of them for xmr. 550ish with out ohgodpill. 650ish with. Not a bad little program guys. I'll check my 580s and possibly my vega setup later and post results. I wasn't going to but I didn't see much in the way of Ryzen results so figured you'd all like to see that.